Ophthalmologists and optometrists are the pit crew that can optimize long-lasting, high-quality visual performance. Undergoing cataract surgery is akin to placing a wedding ring on your long-term vision. Significant thought and care are involved in such permanent decisions. Similarly, with cataract surgery in the dry eye disease (DED) patient, clinicians have the opportunity to convey the importance of thought and care prior to the permanent commitment to cataract surgery. I tell patients that optimizing the ocular surface is an important step toward improving the odds that they drive away with an excellent, long-lasting, high-performance vision machine. The long arc of DED development and treatment is an important collaborative opportunity between ophthalmology and optometry. DED is similar to many chronic, progressive diseases in that prevention and early intervention are key. The best time to intervene in glaucoma, for example, is when early damage is detected during a routine examination rather than when the patient’s cup-to-disc ratio and visual field indicates long-standing disease. Ophthalmologists and optometrists ought to approach the identification and treatment of DED the same way. 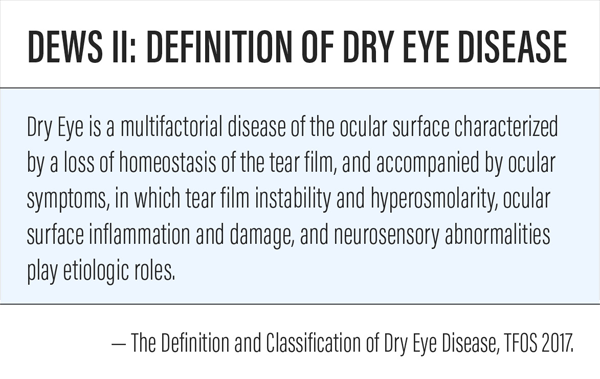 DED is accompanied by tear film instability—a feature so significant that it is part of the definition of DED in the Tear Film and Ocular Surface Society Dry Eye WorkShop II (TFOS DEWS II) report (Figure 1). In other words, DED is a vision-impacting disease. Stabilizing the tear film is no easy task, however, and it is easier with a collaborative, integrated, proactive approach. Figure 1. The TFOS DEWS II study determined that DED was partially defined by tear film instability. Optimizing the ocular surface starts with the health of the entire lacrimal functional unit(LFU)—a collective term embodying the neurosensory pathways, lacrimal glands, meibomian glands, and goblet cells. A healthy LFU should maintain tear homeostasis (and wound healing capacities) in a postsurgical cataract patient. With DED, neurosensory abnormalities may limit homeostasis and wound healing capabilities.2 Neurosensory abnormalities are such an important consideration that they are included in the TFOS DEWS II definition as seen in Figure 1. This new definition of DED helps clinicians expand their thinking and organize their DED-treating philosophy and approach. Healthy vision is like a high-performance sports car that is expected to perform well under a wide variety of conditions. However, with DED, performance is limited, and an eye with an unhealthy LFU is one that needs a tune-up. 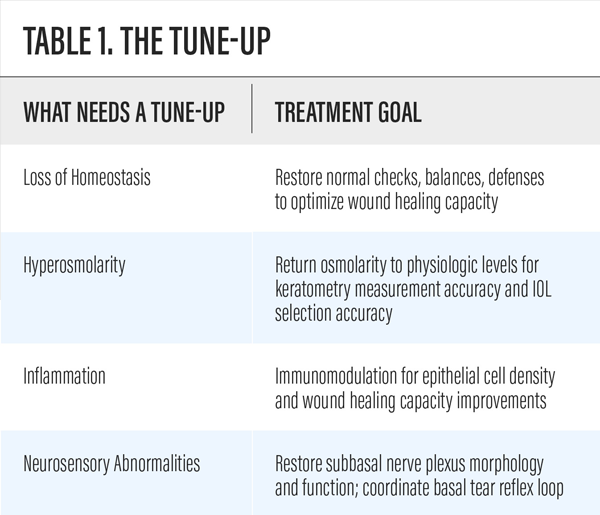 Consider the four items listed in Table 1—a preoperative, four-point tune-up checklist for enhancing the patient’s postoperative high-performance vision machine. The potential for decreasing postoperative complaints, postsurgical refractive surprises, repeat refractions, final glasses optical lens revisions, touchups or enhancements—as well as the potential of decreasing additional chair time—are added benefits for your proactive approach. Ophthalmologists and optometrists are an eye care team—a pit crew focused on the shared goal of optimizing high-performance visual outcomes for each patient. Patients may view the eye care providers as heroes when DED is preoperatively identified and treated; when it is postoperatively identified, the providers may be perceived as something significantly less than heroic. Surgical complications are highly uncommon yet few patients are satisfied with the explanation that, although their surgery was indeed perfect, it is now their ocular surface causing vision issues. With collaboration and teamwork, imperfections of the ocular surface that limit visual performance can be addressed. Untreated DED preoperatively and postoperative DED complications decrease patient satisfaction,4 visual performance,1 and quality of life.5 Ophthalmologists and optometrists working together as a pit crew can make sure that our patients drive away from their global cataract surgery experience with the best possible, long-lasting, high-performance vision machine. Jabbur NS, Sakatani K, O’Brien TP. Survey of complications and recommendation for management in dissatisfied patients seeking a consultation after refractive surgery. J Cataract Refract Surg. 2004;30(9):1867–1874. Iaccheri B, Torroni G, Cagini C, et al. Corneal confocal scanning laser microscopy in patients with dry eye disease treated with topical cyclosporine. Eye (Lond). 2017;31(5):788-794. Epitropoulos AT, Donnenfeld ED, Shah ZA, et al. Effect of Oral Re-esterified Omega-3 Nutritional Supplementation on Dry Eyes. Cornea. 2016;35(9):1185-91. Levinson BA, Rapuano CJ, Cohen EJ, et al. Referrals to the Wills Eye Institute Cornea Service after laser in situ keratomileusis: reasons for patient dissatisfaction. J Cataract Refract Surg. 2008;34(1):32-9. Salib GM, McDonald MB, Smolek M. Safety and efficacy of cyclosporine 0.05% drops versus unpreserved artificial tears in dry-eye patients having laser in situ keratomileusis. J Cataract Refract Surg. 2006;32:772–778.